Epitaph, Singapore Memorial, Column 139, Age 30. 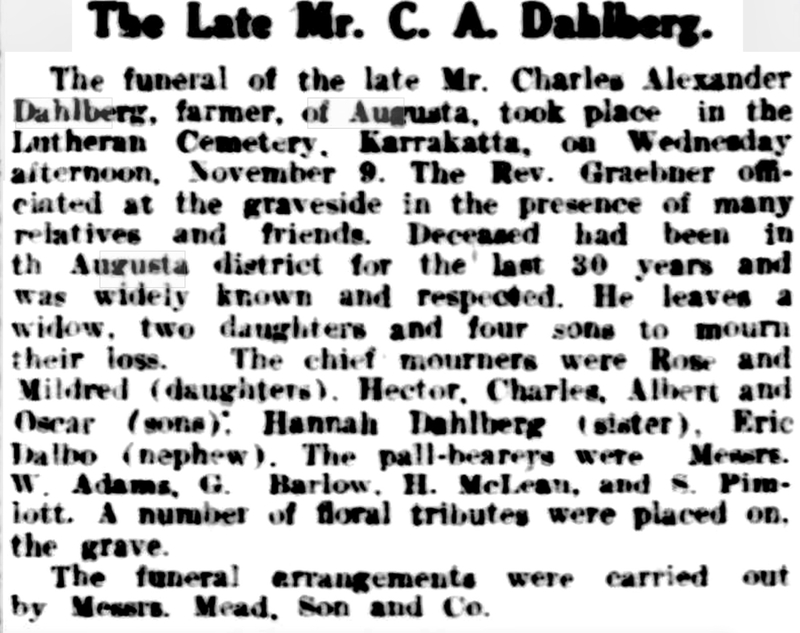 Albert Edward Dahlberg was the second born of 4 sons and 2 daughters born to Charles Alexander and Bertha Dahlberg. The Dahlbergs married in 1905 Karridale. 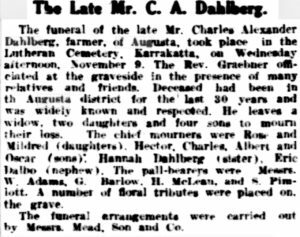 In 1933 Albert’s father Charles died, he had been farming at Augusta for 30 years. In 1936 and 1937 Albert and brother Oscar who was 4 years younger, worked at Hoffmans Mills (27 kms north-east of Harvey). About the time Albert enlisted, Albert’s mother and some family members were residing at Augusta. The above notice was printed in West Australian’s Country News, July 1941. In July 1999 Murray Ewen received a letter from a nephew of Albert, Vern Tinley from Augusta. He wrote that he learned that whilst at small family social gathering with Albert’s only living sibling, his brother Oscar, his wife and several close friends that Albert and his sweetheart Mary became engaged before he went to Singapore however decided to keep secret and not tell their families. Mary, then in her 80’s was very interested in viewing the families photos including those with Albert and said “I have a lovely photograph of your mother (Vern’s mother) with her brother Albert, and a photo of Albert in uniform before he went away”. Vern was intrigued and asked how she, Mary knew Albert and his mother. Included in Vern’s letter was a further story about Albert. 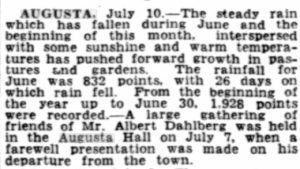 Albert’s mother Bertha Dahlberg was known to have premonitions and during her lifetime foretold many events. She told her family that during the early hours of the morning of the day Albert died, 10th February 1942, he came to say goodbye to her. He called out to Bertha, “Mum” from the doorway of her bedroom. Albert was dressed in white and she replied “Oh my son, you are home, thank God you are home. I have prayed for this.” As Bertha moved towards Albert his image receded and faded into the room behind. In the family kitchen the following morning, a distressed Bertha told her family her story and of seeing Albert. She knew he was dead. The family believed her to be overwrought and said she had had a dream which appeared so vivid because she was worried. 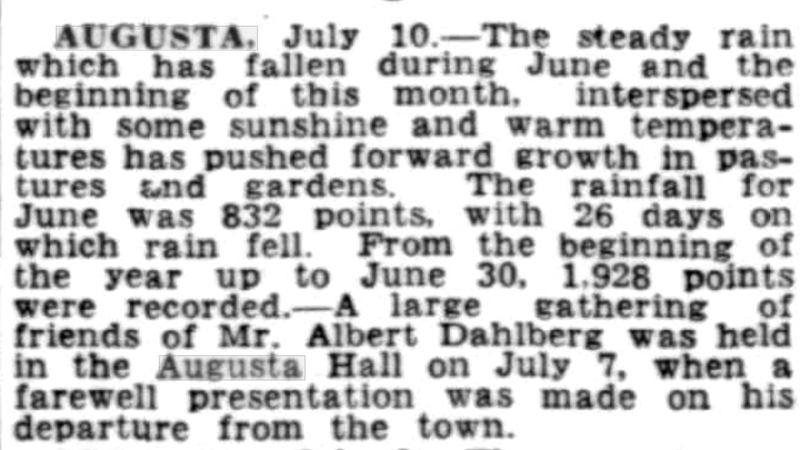 Bertha and the Dahlberg family did not receive confirmation and news of Albert’s death until April 1946. Bertha Dahlberg died in October 1947.